See clearly even in total darkness! Equipped with an 8mm lens to give you a very wide field of view, and illuminators that see out to 100 feet, this new ultra low lux night vision camera is a safety device no vessel should be without! This camera allows you to see even in total darkness! No longer will have to stare out a window trying to see what's out there! No more guesswork about those targets your radar is showing you. This camera will show you what's out there, regardless of visibility or weather conditions! Get a crisp, clear image of anything on the water! 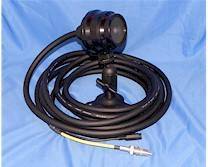 The IR illuminators allow the camera to provide images as far as 100 feet away. Operate your vessel safely even in total darkness. Avoid hazards such as boats that are running or anchored without lights. SEE floating logs and other debris, harbor or marker buoys, etc. Safely navigate in unfamiliar waters or marinas, or find your own slip in the darkness. Small and Compact! Easily adaptable to any vessel. Doesn't block your line of sight. Portable! It can easily be removed and stowed when your vessel is in the slip or in storage. Rugged construction! Encased in a sealed aluminum housing, (sealed to IP66 standards), splash proof and damage resistant, making it very durable and water tight for on deck mounting locations.